Create games where the actions of others quite literally change the world around you. Consider one of the most iconic multiplayer interactions of all time briefly recreated in our demo game above. There are other interactions that'd be very easy to create. Another example would be requiring a tinderbox to light a fire, and fire is required to cook food. A friend could light the fire for us then we could proceed to cook dinner for our group. While much harder, you could have player actions make much larger skill changes throughout the world. Completely destroying or building up cities are not impossible based on player decisions alone. 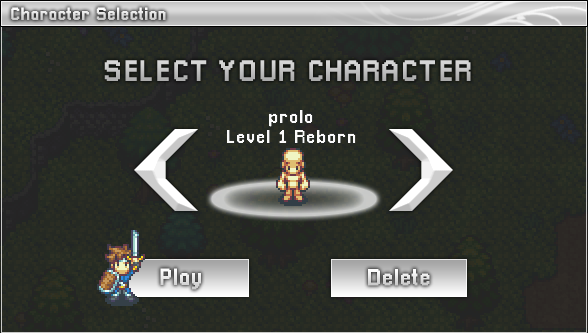 Intersect allows game designers to specify how many characters each account may have. The default value is three characters per account, you could allow as few as 1 character or upwards of 20. Intersect offers PvP and PvE combat opportunities, but you, the designer are in full control. You decide which areas are safe and which areas offer no protection from other players. Our combat systems allow equipping weapons and armor, spell casting, and item buffs. Projectiles allow for creating guns, bows, and all kinds of crazy effects. Spells can be configured for AoE damage or healing, and straight up weirdness with stuns, slows, roots, stealth, transforms, dashes, and so much more! 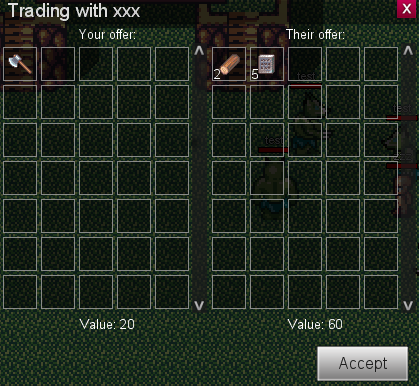 Your players can trade items with others! Trading is a critical feature that encourages your players to connect, collaborate, and bond while playing your game! Your players can create parties, work together, and get rewarded for doing so! Conquer challenges, share experience, and you can provide parties with AoE healing effects along with other in-game buffs! Your players can communicate in so many ways. Send private messages to one another, speak in local, global, and party channels! Admins can speak privately among themselves in an admin chat channel. Our event system allows custom player slash commands, so you could even create a /smile command in your game and see a smiley appear above your players heads! Know when your friends are online and where they are! 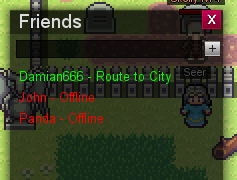 You can start private messages with friends from the friends list! Get together, start a party, and go conquer the world together!